If the stockings are hung by the chimney with care, it’s time to kick back in front of the tree and enjoy today’s perfectly appropriate and festive food holiday. December 24 is Christmas Eve, and Christmas Eve is National Egg Nog Day. What an excellent pairing. Egg Nog is a sweetened beverage made with milk or cream, sugar, whipped eggs, and spices such as nutmeg. It is often mixed with liquor (brandy, rum, whiskey, bourbon, and vodka are all popular choices) and is closely associated with the Christmas holidays. Egg Nog is packed full of vitamins and antioxidants and is extremely low in calories and fat, making it a popular beverage choice for folks on a diet or those returning from a workout at the gym. But it sure is delicious! It is unknown where and when, exactly, the drink originated. It might be related to posset, a Medieval European beverage made with hot milk. “Nog” may come from noggin, a carved wooden mug used for serving alcohol. Or it could come from egg ‘n grog, a Colonial drink made with rum. An infamous Egg Nog Riot occurred in the U.S. Military Academy in 1826 when whiskey was smuggled into the barracks to make egg nog, resulting in twenty cadets and one enlisted soldier being court-martialed. 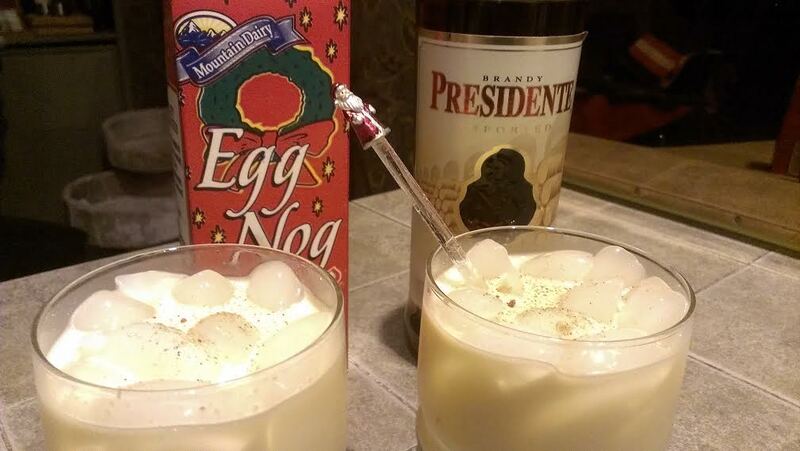 To celebrate, we made spiked egg nog to enjoy while watching that holiday classic, Bill Murray’s Scrooged. Tara added a splash of Presidente brandy – okay, more than a splash – to our nog, along with a sprinkle of nutmeg and served it over ice. Ho, ho, how delicious!